Paul Kimbrough enters his third year as Executive Director for AVSA. Paul comes to Russellville after several stops including serving as United States Program Director for PLAYSoccer International, Director of Coaching at Texarkana United Soccer, and Youth Development Coach at D.C. United. Paul holds a Masters in Coaching Education from Ohio University, United Soccer Coaches Premier Diploma, USC Master Coach Diploma, USC Advanced National Goalkeeper Coach Diploma, and in 2018 he is completing the USSF A License. He can be reached at avsadoc@gmail.com or at 479-437-9669. Sloane Bertke, a native of Kentucky, starts her first year as Director of Player Development for AVSA. Sloane earned her Bachelor of Arts degree in Exercise Science from Asbury University in Wilmore, Kentucky. She was a four year student athlete playing for the Asbury University Women’s Soccer team, being the starting center back defender all four years. During her tenure at Asbury University, Sloane was a member of three conference championship teams and made two National tournament appearances. Sloane was named Co-Captain her senior year. 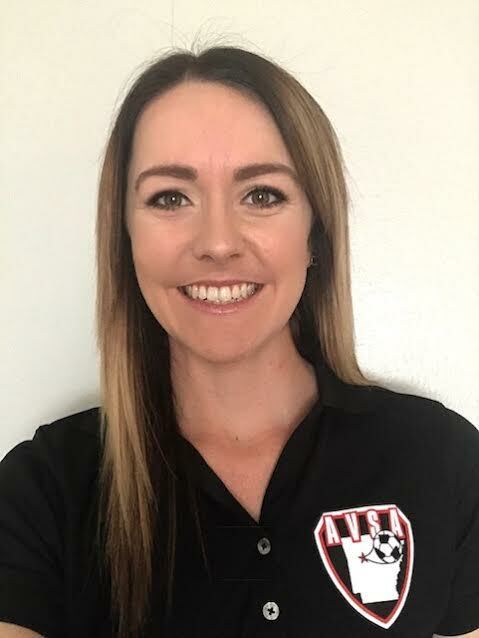 Prior to joining the AVSA staff Sloane served as the assistant high school and middle school girls soccer coach at her alma mater South Laurel High School. She has helped run multiple camps for ages ranging from 5-16. Sloane is a certified E-licensed coach.